There’s a saying in Jamaica, “Tun Yuh Han Mek Fashion”. When translated it means Turn your hand and make a fashion. It’s the art of creating something amazing out of nothing. In the kitchen, it’s the ability to whip together a delightful dish or an entire meal out of scraps. 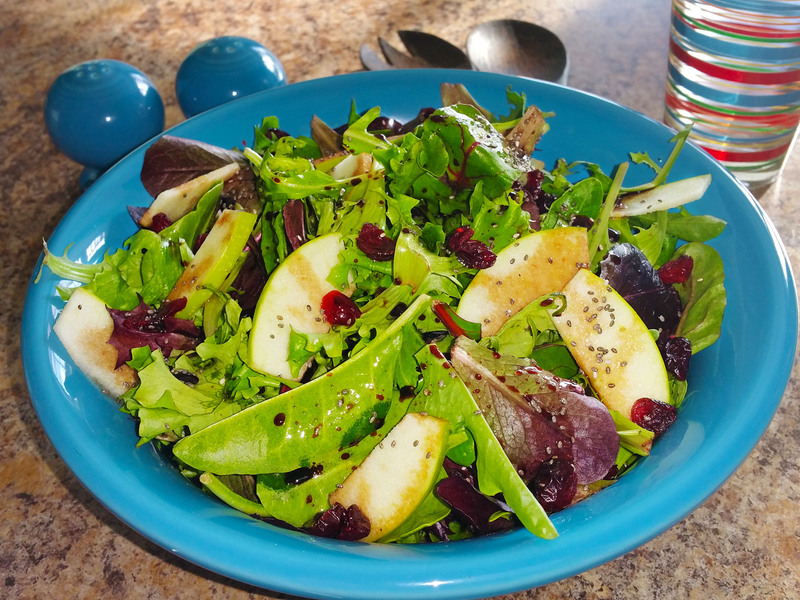 The field greens, granny smith apples, Craisins and chia seeds, topped with home-made Pomegranate-Balsamic Vinaigrette pictured here, are leftovers from a couple of recent events. It’s a scaled down version of my Winter Salad that I’ve been dishing up since the beginning of fall. Missing are avocado, cucumber and pomegranate seeds that serve to round out this crisp, tart, semi-sweet and seasonal salad course. We can probably agree that an exceptional cook can turn up the heat in any situation. Jamaica has a history and culture built around that. So, while the essence of Jamaican cuisine delivers incredible flavor, the art of Jamaican cooking is being able to pull it all together tastefully. This entry was posted in Blog, Cooking, Jamaican, Salads by Janet Davis. Bookmark the permalink.